Drawn & Quarterly Reveals Their Winter 2017 titles! Last week at San Diego Comic-Con Drawn & Quarterly announced Guy Delisle’s Hostage and Brigitte Findakly and Lewis Trondheim’s Poppies of Iraq, to be published in Spring and Fall of 2017 respectively. But, before those two books are released there’s still a lot of other graphic novels coming out. D&Q’s winter list features two biographies of very different and very fascinating people (Peter Bagge’s take on Zora Neale Hurston and Joe Ollmann’s take on William Seabrook); a graphic-novel-adaptation of the iTunes terms and conditions agreement by R Sikoryak; reprints of fantastic and iconic works by Vanessa Davis and Lynda Barry; a graphic novel that blends autobiography, biography, and hagiography by Michael DeForge; a literary work about urban burnout from Yeon-sik Hong; and of course, further entries in our Kitaro and Moomin series. Check out the full set of releases below! 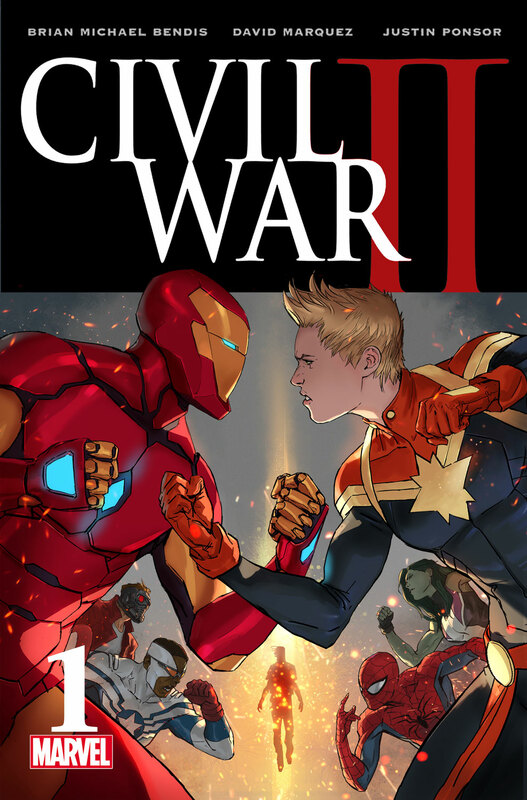 Top Pick: Civil War II #1 (Marvel) – Here it is! The start of the next event that is going to split the hero community in half…again. You would think they would have learned after the first throw down. This time though, it isn’t registration that is looking to control the heroes and their actions; now we have an Inhuman who can see into the future…and there are those who think this can be used to prevent disastrous events. Is the future written in stone? Can you hold someone responsible for something they may do? That’s what the Marvel Universe will be exploring and you can bet it’s going to get ugly. A-Force #6 (Marvel) – It’s A-Force vs. Nico (under the control of the Countess). Medusa has been skeptical about Nico’s powers from the start of this team…it’s going to be very interesting for her to find out first hand just what Sister Grimm can do. I just hope A-Force survive the ordeal. I’ve been a fan of this book since the start, and I am always excited when a new issue comes out. It’s a great read with laughs, sass and action; who can ask for anything more? Green Arrow: Rebirth #1 (DC) – Yeah yeah, here’s a DC title on my list. I’ll be honest, I’m interested in this to see Black Canary and Green Arrow together again. Yes, I know that is just the gimmick (as mentioned in previous articles) DC is using to get readers into this Rebirth. Me, not being a regular to the DC universe, think this is a great time to jump in and see if it’s enough to make me consider making room for DC AND Marvel in my life. Old Man Logan #7 (Marvel) – Logan is just looking to lay low and figure out his place in this new world he’s found himself in. Too bad Lady Deathstrike and her Reavers have other plans. I am really looking forward to seeing this showdown; this isn’t the Logan that Deathstrike is expecting to find…she may just get more then she bargained for. Top Pick: Batman: Rebirth #1 (DC Comics) – It’s our first look with Tom King who is taking over writing duties from Scott Snyder. Deadly Class #21 (Image Comics) – Summer finally is here, as freshmen finals end; but another freshman fails to make it to sophomore year. Rick Remender’s depressive, but action filled, take on prep school assassination madness,continues to entertain. The Goddamned #4 (Image Comics) – Another biblical inspired story. It focuses on a seemingly immortal and wandering Cain, after the fall; set in the period of the mythical Nephilim prior to the flood. Jason Aaron weaves yet another must-read grim proto-human story. Saints #9 (Image Comics) – Another excellent maxi-series reaches its conclusion. The holy war (or unholy, depending on your opinion) ends, when the young and hipster Saints crew come face to face with the Archangel Michael and God. Unfollow #8 (DC Vertigo) – This dark spin on social media continues, with more of the 140 dropping off, but a new follower enters the fray. Top Pick: Birth of Kitaro GN (Drawn & Quarterly) – Kitaro is one of the most beloved characters in Japan. Created by Shigeru Mizuki, the titular character encounters a wide variety of yokai (creatures from Japanese folklore) in stories that appeal to both those interested in Japanese folklore and mythology as well as funny, great, entertaining manga. Finally, the West gets the first of a planned series of volumes with a translation by Zack Davisson. Civil War II #1 (Marvel) – Say what you will about events for Marvel, this one looks to be the first event to make an impact in the post Secret Wars universe. Issue #0 didn’t really set many things up but did show a not too pleasant looking future. It will be refreshing to hopefully continue to have the series’ perspective from the same characters from the introductory issue. Moon Knight #3 (Marvel) – Jeff Lemire, Greg Smallwood and Jordie Bellaire have been hypnotizing the reader thus far with a mysterious, brooding tale of Marc Spector combatting both demons (or Gods) both in his mind and in the physical world. This series has picked up the reigns from the last run of ‘Moon Knight’ and continues to prove that the character is one of the most intriguing in the Marvel universe. Paper Girls #6 (Image Comics) – The first five issues were a fun callback to the action/adventure movies of the 1980s. It will be interesting to see what is in store with this title as the time frame switches to 2016. Plus, it is pretty hard to pass on Brian K. Vaughan, Cliff Chiang’s gorgeous visuals and one of the best colourists in the game with Matt Wilson. The Revisionist #1 (Aftershock Comics) – Frank J. Barbiere is back with another intriguing title that is sure to bring the wit and fun nature of past titles like ‘Five Ghosts’, alongside artist Garry Brown and colourist Lauren Affe. All it takes, beyond the creative team, to be sold on this book are three words: time-travelling assassin. Plus, Aftershock has been releasing some really fresh, outside the box kinds of titles. Top Pick: 4001 A.D. #2 (Valiant) – I’m not going to lie – I’ve already read this. It’s my top pick because I can’t wait to see the artwork in printed form. So excited. The Goddamned #4 (Image Comics) – It feels like an age since the third issue came out, and I hadn’t realized how much I missed reading Jason Aaron’s take on the time before Noah needed his Arc. Brutal, bloody, and probably offensive. I love it. Moon Knight #3 (Marvel) – To be honest, this isn’t the best Moon Knight series I’ve ever read, but it’s far from the worst. With each issue getting a little better, I’m hopeful for the rest of the series. Old Man Logan #7 (Marvel) – After the anticlimactic first arc, the old man’s second story arc is, so far at least, feeling a hell of a lot better. What’s more classic Wolvie feeling than having him face off against the Reavers? Will Eisner’s The Spirit #11 (Dynamite Entertainment) – Speaking of things I love… this is arguably the best series being published right now featuring an urban based vigilante. Top Pick: The Red Virgin & the Vision of Utopia (Dark Horse) – A portrait of revolutionary feminist Louise Michel, who took up arms against a French regime that executed thousands. Deported to a penal colony, Michel joined the cause of the indigenous population against colonial oppression. Is there a more “me” graphic novel? Been reading it, and it’s really interesting. Chum #2 (Comixtribe) – The first issue was a great mix of surfing and noir. Take Jaws, minus the giant shark, and add a crime story to it, and you have this comic. So good and looking forward to seeing where it all goes. Hellboy in Hell #10 (Dark Horse) – This is it. Hellboy transforms into what he was always meant to be as Mike Mignola wraps up this series. Rough Riders #3 (Aftershock Comics) – FDR and his gang of historical figures are heading to Cuba. There’s something really fun about this alternate history comic that dives deep into real history to get things right. It’s entertaining and will get you to do some research too. Superman: Rebirth #1 (DC Comics) – I loved the Superman: Lois and Clark miniseries and to see where and how this Superman fits into the Rebirth universe is going to be very interesting. That miniseries was filled with action, but also a lot of positivity. This issue serves as a fantastic end cap to that bridging the cap between that and what’s to come. Drawn & Quarterly, comiXology and Amazon have announced a distribution agreement bringing Drawn & Quarterly to the digital platforms. You’ll now be able to get Drawn & Quarterly’s digital comics and graphic novels on comiXology platform as well as Amazon’s Kindle Store. Kate Beaton on tour for Step Aside, Pops! Step Aside, Pops is Kate Beaton‘s sequel to the hit comic collection Hark! A Vagrant, which appeared on best of lists from Time, NPR, and USA Today; spent five months on the New York Times bestseller list; and won Harvey, Ignatz, and Doug Wright awards. Beaton returns with all-new sidesplitting comics that showcase her irreverent love of history, pop culture, and literature. Collected from her wildly popular website, readers will guffaw over “Strong Female Characters”, the wicked yet chivalrous Black Prince, “Straw Feminists in the Closet,” and a disgruntled Heathcliff. Delight in what the internet has long known—Beaton’s humour is as sharp and dangerous as a velocipedestrienne, so watch out! Signing and panel schedule to come. SPX admission is $15 Saturday, $10 Sunday, or $20 for a weekend pass; available on-site. Purchase your ticket here or in store beginning August 21 at 11am, at which time the book will be available for pre-purchase. Tickets are 5$, or free with the purchase of Step Aside, Pops. Tickets are $22 and include a copy of Step Aside, Pops. Drawn & Quarterly’s fall 2015: Beaton, Tomine, Mizuki, Chippendale, and more! What a year 2015 is shaping up to be, Drawn & Quarterly‘s 25th anniversary is bringing new work this spring from Jillian Tamaki, Michael DeForge, Marc Bell, Anders Nilsen, and more, not to mention their mammoth 25th anniversary tome itself, which they will be previewing in due time. Check out some of the books we’ll be seeing this year. 2015 is less than a month away, and it’s going to be an extra-special year: in addition to Drawn & Quarterly‘s usual dazzling lists showcasing the talents of the world’s best cartoonists, they’ll also be celebrating their twenty-fifth anniversary with a gorgeous, 700-plus-page collection detailing the company’s history and featuring new and rare work from D+Q cartoonists and essays from Margaret Atwood, Sheila Heti, Jonathan Lethem, and many, many more! Check out what they have plan for the first half of next year. Now in paperback, expanded with sketches from Delisle’s time in Jerusalem! Small Press Expo 2014 is just days away! SPX is happening this Saturday, September 13th (11am-7pm) and Sunday, September 14th (12pm-6pm) at the Bethesda North Marriott Hotel and Conference Center (5701 Marinelli Road) in Bethesda, Maryland. Admission is $15 on Saturday and $10 on Sunday, or $20 for the full weekend. Tickets are on sale at the door. Drawn & Quarterly has tons of debuts and even more dazzling guest authors, at booth #W1-4. All signings take place at their booth, #W1-4, against the wall. Panels take place in various rooms, so please take note below to make sure you don’t miss a thing! Drawn & Quarterly also has books debuting at the show. This year marks the 20th Anniversary of SPX, which will be held September 13 and 14, 2014 at the North Bethesda Marriott Hotel & Conference Center. SPX is honored that over 150 different graphic novels and comics will be making their publishing debut at this years show to start off the Fall book buying season. A complete list of debuts, including cover images and publishing information, can be found on the SPX web site. Syllabus: Notes From An Accidental Professor is the latest from Lynda Barry and Drawn and Quarterly that reveals how Ms. Barry teaches the world of writing and comics in her own creative and humorous way. Raina Telgemeier follows up the her best selling books Smile and Drama with the autobiographical Sisters from Scholastic/Graphix, explaining the long and complex relationship she has with her younger sibling. Charles Burns Sugar Skull from Pantheon completes the nightmarish dream world trilogy that began with X’ed Out and continued in The Hive. Ben Hatke’s heroine Zita returns in returns in Legends of Zita the Space Girl from First Second. Through the Woods is Emily Carroll’s first print book that collects her award winning web comics. Roman Muradov’s (In a Sense) Lost and Found, published by Nobrow, is the first full length graphic novel from this Society of Illustrators Gold Medal winner. Drew Friedman turns his caricaturing genius to the great comic book creators in the Fantagraphics release, Heroes of the Comics: Portraits of the Legends of Comic Books. Michael DeForge debuts Lose #6, the latest installment of his award winning comic from Koyama Press. Invincible Days is a collection of short stories by Patrick Atangan released by NBM. D+Q’s 40% off Black Friday/Small Business Saturday/Cyber Monday Websale! As they’re Canadian, Drawn & Quarterly might not totally get all of the American shopping holidays going on right now. But, that’s not stopping them from having a sale on their website that runs through Black Friday, Small Business Saturday, and Cyber Monday. Buy any item from their web store and receive a b-a-n-a-n-a-s 40% discount through Monday, December 2nd. Yes, any item! This sale includes books, comics, and posters. And, since all their 2013 titles are now available for sale, every awesome book you’ve thought about buying this year (for yourself or for a pal) is also available at a sale price. That includes Best of the Year list-toppers like Co-Mix, Marble Season, The Property, Susceptible, You’re All Just Jealous of My Jetpack, and much much more. There’s a handy round-up of them over on their blog. P.S. If you’re Montreal-based, you can also come into their store this week and save! All Drawn & Quarterly-published books and comics are on sale for 25% off at the Librairie Drawn & Quarterly (211 Bernard O. in Mile End)! SPX 2013: D+Q, Bagge, Hanawalt, Modan, Nilsen, Ralph, Seth, Tomine, Zettwoch! This weekend, Drawn & Quarterly head to the Bethesda North Marriott Hotel & Conference Center for the 2013 edition of the Small Press Expo! The show runs from 11am to 7pm on Saturday September 14th and 12pm to 6pm on Sunday September 15. Tickets to SPX cost $10 for one day, and $15 for the whole weekend. Below is a list of signings and panels for the whopping eight cartoonists who will be at SPX – Peter Bagge, Lisa Hanawalt, Rutu Modan, Anders Nilsen, Brian Ralph, Seth, Adrian Tomine, and Dan Zettwoch. Come on down to Ye Olde D+Q Booth W1-4 – that’s where all these signings will take place! And be sure to check out the full list of panels and participants on the SPX site! Israel’s Office of Cultural Affairs and participating Consulates worked with D+Q in making Rutu Modan’s tour possible. 9:30 pm Ignatz Award ceremony! Make sure to have cast your ballots! SPX Special Guest Seth’s Palookaville 21 – get yours signed! SPX Special Guest Peter Bagge’s Woman Rebel – get yours signed! Brian Ralph’s Reggie-12 – get yours signed! SPX Special Guest Anders Nilsen’s Rage of Poseidon – get yours signed!